Israeli Prime Minister Benjamin Netanyahu delivers a speech on Iran's nuclear program at the defense ministry in Tel Aviv on Monday. Former weapons inspectors say an apparent trove of information on Iran's nuclear weapons program will increase pressure for more intrusive inspections of its atomic sites. On Monday, the Israeli government disclosed it had obtained thousands of pages of documents and nearly 200 CDs' worth of data on Iran's nuclear program. "Everything you're about to see is an exact copy of the original Iranian material," Israeli Prime Minister Benjamin Netanyahu told reporters. His presentation included blueprints, photos and documents that he claimed were stolen from a vault in Tehran earlier this year. Netanyahu said Israel was prepared to share the documentation with the International Atomic Energy Agency. The IAEA is the body charged with conducting comprehensive inspections of Iran's nuclear sites under a 2015 deal that froze the nation's nuclear program in exchange for sanctions relief. The IAEA has long known that Iran once had a nuclear weapon's program, despite Iranian denials. That assessment is based on information provided to the agency by other countries, as well as the IAEA's own efforts to probe sites inside the Islamic Republic. In a 2015 report the IAEA provided numerous details about the old Iranian program, known as project AMAD. Nevertheless, former inspectors say the documents obtained by the Israelis could provide still more information about what the Iranians were up to in the late 1990s and early 2000s. "Certainly if this is what they say it is, this is quite a jackpot," says Olli Heinonen, a former weapons inspector who is now with the Foundation for Defense of Democracies. Heinonen adds that the documents shown by Netanyahu appear to be authentic, and are consistent with information contained in some unpublicized documents obtained by the IAEA when it was investigating the Iranian program. "There were some pictures that were quite familiar to me," he says. "But at the same time, there was also new information." Among new details publicly disclosed in Netanyahu's 20-minute presentation were old Iranian plans to initially field five 10-kiloton nuclear weapons. "That's like five Hiroshima bombs to be put on ballistic missiles," Netanyahu said in his speech. 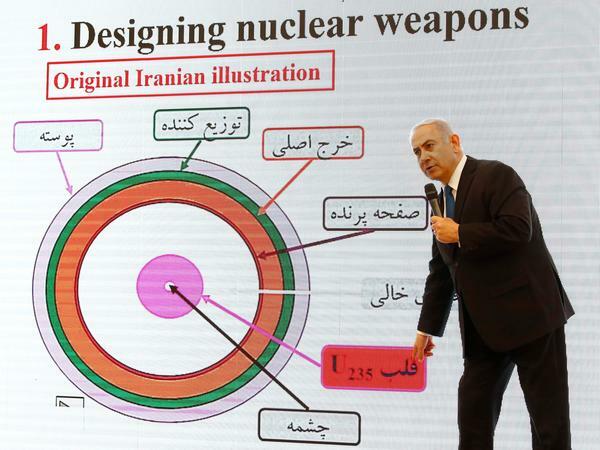 The Israeli prime minister also showed a map of possible sites where Iran once apparently considered testing a warhead underground. Not everyone agrees that this kind of information is groundbreaking. "I didn't really learn anything new that the IAEA hasn't said publicly before," says James Acton, co-director of the nuclear policy program at the Carnegie Endowment for International Peace. In a Twitter thread, Jeffrey Lewis of the Middlebury Institute of International Studies pointed out that many of the things shown in Netanyahu's report had also been detailed in the 2015 report. "I have yet to see anything new, but there are thousands of pages of documents and they should all be handed over to the IAEA," Lewis said in an interview. Still, the devil is in the details, and those new details could shift the IAEA's relationship with Iran, says David Albright, a former United Nations weapons inspector who worked on Iraq's nuclear program in the 1990s. Albright, who was privately briefed on the archive, points out that Iran's position that it never had a nuclear weapons program appears all the more untenable, given the new disclosures. "Here we have a jigsaw puzzle with 30 to 40 percent of the pieces [turned into] one that has 99 percent of the pieces. The picture is clear," he says. Both Albright and Heinonen believe the agency may decide to step up inspections based on what's in the documents. Heinonen says that some images appear to show pieces of equipment directly related to nuclear weapons work which had not been previously disclosed. "They must have manufactured pieces of equipment in Iran. Where are those pieces? Who is keeping them?" he asks. Albright says the documents may also contain information about the places where work has been done. The IAEA could use the documents to seek inspections of new sites, if it so chose, he says. The IAEA did not immediately respond to NPR's request for comment about the Israeli disclosures. But in a statement on its website, it said that it had long been aware of the nuclear weapons work of Iran. The agency believes that work stopped in 2009, before the current agreement was signed. The statement says the agency will review any information provided to it. "However, it is not the practice of the IAEA to publicly discuss issues related to any such information."